I anchor the evening newscasts on KING 5 at 5, 6:30 and 11 p.m. with Lori Matsukawa. When I first arrived at KING 5 in August 2011, I was star struck at the broadcast legends I met in the newsroom — those who worked both in front of and behind the camera. I remember making small talk with a photojournalist. “How long have you worked here?” I asked. “Since Watergate,” he said. I laughed, thinking it was a joke. He replied, “I’m serious.” That’s when I started to realize the depth and knowledge that surrounded me. I remember feeling humbled and honored to work with so many talented people. I still feel that way today. When I used the word legend earlier, my co-anchor, Lori, is one of the people I was talking about. Lori has worked at KING for 35 years. People ask me if she’s as nice as she seems on TV, and I always answer nicer, because it’s the truth. How did I get to KING? It’s a long story, but I’ll give you the short version. I was born at Swedish Hospital in Seattle, and lived in Burien for the first five years of my life. My dad owned a pizza restaurant called Pizza Pete’s in White Center. I remember running around the restaurant with my two brothers wearing a paper cooks hat, putting nickels in the juke box. Remember those? My dad eventually sold the restaurant and went into insurance sales. In the morning as my dad left for work, my brothers and I would shout “sell, sell, sell” to motivate him. A lot of who I am came from my dad — especially my sense of humor. My mom, who still lives on the family farm, is where I get the rest of my traits. She’s the kindest, most loving person I know. She has always been there for me, even when I struggled to find my way. When I was in kindergarten, my family moved from Burien to Ferndale, in Whatcom County, where we lived in a house on my grandparents' property. My great-grandparents settled there in 1905. After Woodstock, my two uncles started an organic vegetable farm on the property. It’s one of the oldest organic farms in the state. That’s where my brothers and I worked from the time we were in elementary school. It was good, hard work that kept us out of trouble. My childhood was a really wonderful, rustic experience. We didn’t have TV until I was in 8th grade (funny that I now work in television). We heated our house with wood that we cut in the summer and fall, and raised our own beef. We spent hours playing in the woods every day and climbed a lot of trees. In school, I played the drums in the marching band, and absolutely fell in love with drumming at Ferndale High School. I still play almost every day on a drum set. For me, it’s therapy and a great workout! The greatest moment in my drumming career came when my friend Alan White (drummer for YES) let me sit in with his band during a benefit concert. The drum kit he let me play that night was the same kit he used to record "Imagine" with John Lennon. I could have been hit by a bus that night and would have considered my life complete. I went to college first at Western Washington University in Bellingham, then transferred to Washington State University in Pullman. My wife tells me not to mention why I changed schools, but I do anyway. I went to WSU to bowl on the bowling team. It’s one of my other passions. My highest average is 210. My highest sanctioned game in league play is a 290. I’m toying with the idea of getting a coach and hitting the senior PBA tour now that I’m over 50. While at WSU, I fell in love with two things … well, make that one person and one thing. I met my wife at Washington State, and am still happily married 28 years later. We have two sons — one is a freshman in high school, and the other is a senior at Gonzaga. In Pullman, I studied at the Murrow College of Communications — named for legendary broadcaster Edward R. Murrow. Murrow is an inspiration to me because he stood for truth during the McCarthy Era in Washington D.C. Today, we journalists are being attacked by the very highest levels of government. I have no doubt if Murrow were alive today, he would be standing firm — committed to reporting the truth. My broadcasting career started while I was in college at WSU. I worked for the campus-owned public radio station in Pullman. I went on to work as a legislative correspondent for KBSU Public Radio in Boise, Idaho, and later worked as a reporter for Spokane Public Radio. I spent 10 years on the air in Spokane. Most of that time, I worked at KXLY — a radio/TV combo station. I started at $5 an hour pushing buttons, part-time, on the radio overnight. I was living in my future in-laws' sewing room in their basement while my wife finished college at WSU. I can only imagine how concerned they must have been that their daughter wanted to marry a guy who was making $5 an hour, part-time, but they never said so. They were and are the most generous, supportive people I know. At the end of my 10-year stint in Spokane, I was the evening news anchor at KXLY-TV. I left to take a job as morning anchor at KSTU in Salt Lake City. We had a wonderful time there — got to ski, watch the Olympics and take in the beauty that is everywhere in Utah. I also got to be in a couple of movies during my time there. One was directed by Salma Hayek. It’s called “The Maldonado Miracle.” It was such fun getting to meet and work for Salma. I jumped at the chance to return to Seattle in March 2003 when offered the evening anchor job at Q13. I worked there for 8 years before joining KING in August 2011. I worked with Joyce Taylor for five years on KING 5 Mornings. Two years ago, I moved to evenings when Dennis Bounds retired — another legend I mentioned off the top. When I’m not with family or at work, I spend a good deal of time with the Rotary Club of Seattle. It’s a service organization of about 400 members. We work on things like wiping out polio and ending homelessness. I had the honor of serving as the club’s President during the 2017-18 year. That was a wonderful experience. As fate would have it, one of my closest friends and mentors in the Rotary Club is Dorothy Bullitt. Her grandmother, Dorothy Bullitt, founded KING 5! As I get older, I delight in these kinds coincidences in life. I actually believe they’re not coincidences as all, but that’s for another time. If you have kept reading to this point, God bless you. Know that I consider it a true honor to come into your home each night with the news. It is a privilege that I take very seriously, because what we do as journalists can and does have in impact on the people we cover and the community at large. Thank you for watching KING 5. If you have a story idea, please send it to my personal email address: mwright@king5.com. 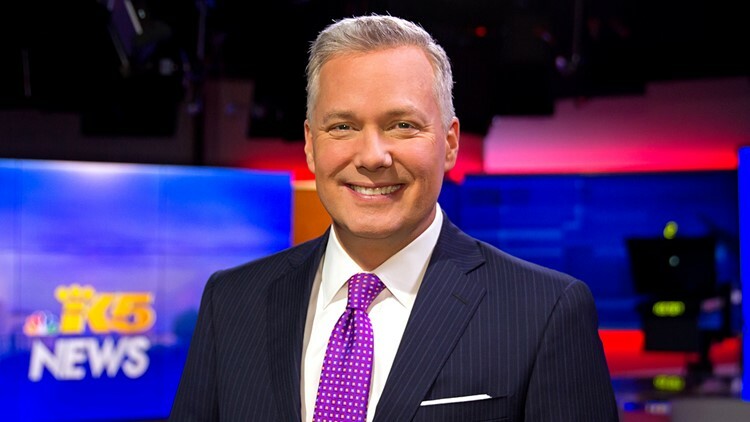 I'd be honored if you followed me on Twitter @markwrightking5 and on Facebook.